We’re often quick to criticize the Yankee front office and ownership when they do something silly (Hank? Anyone seen Hank? ), stupid (like criticize the team’s franchise player) or just plain baffling (like sign overused relievers to multi-year deals). But it isn’t often that we take the time to acknowledge them when they do something that reminds us the Yankees remain the classiest organization in all of MLB. The latest example of that came about the other night. If you weren’t there or weren’t paying attention, the Yankees hosted the Orioles on what may have been one of the ten worst nights in history to play a baseball game. (Yankees won 7-1, by the way). The wind chill was in the low-30’s for the entire game, and when it wasn’t foggy there was a steady drizzle of what felt like wind-driven pellets. Often, there was both. It stands as a testament to loyal Yankee fans that anyone bothered showing up for the game. The announced crowd of 42,171 obviously included a lot of people who didn’t venture into the elements, since there is no way there were 32,000 people in the stands – let alone 42,000+. Under different circumstances, the game might have been called due to weather. It certainly wasn’t ideal conditions to play a game and I’m still surprised none of the players wound up with a pulled anything afterwards. But that would have meant the third postponement in the Yanks first seven home games – something no team wants to do. But the Yankees, midway through the game, announced everyone with a ticket could use their stub to either get a free ticket or 50% off a ticket for the high-rent district (excluding suites) to ANY other game. It’s a simple gesture of thanks to the 42,000 people who bought a ticket to a game that nobody should have been forced to watch outdoors. And one that will cost the Yankees every penny they made from this game – and possibly more, depending on how many of those $5 bleacher seats wind up getting traded in for a half-off ticket in the 200 level. I can’t think of another team that’s willingly thrown away a game’s gate. Class? You betcha. Thank you, Yankees. Now I know Opening Day is right around the corner! At 10am, Yankees single game tickets go on sale. It’s a great way to pick and choose the games you want to see! Visit Yankees.com, the box office at the Stadium or Modell’s to get your tickets! “On Saturday, March 5, from 10:00 a.m. ET – 3:00 p.m. ET, the Yankees will host a Season Ticket Open House event at Yankee Stadium. At this event, fans that are interested in acquiring new Season Tickets will be able to personally view and choose from select seat locations. “This Open House event is free and open to the public. “Season Tickets are the best way to guarantee your spot for the entire 2011 home schedule. Interested? You can RSVP here. For all of you fans out there that are having a cold winter, here’s a post that should give you a warm fuzzy feeling. The schedule is out for Spring Training 2011, which starts on February 26th for the Yankees. The prices are a little higher than I expected, but when else would you be able to see the Yankees this up close and personal for under $35 bucks? Sat., Feb. 26 PHILADELPHIA 1:05 p.m. Sun., Feb. 27 Philadelphia at Clearwater 1:05 p.m. Mon., Feb. 28 Detroit at Lakeland 1:05 p.m. Tue., Mar. 1 Pittsburgh at Bradenton 1:05 p.m.
Florida 4 at GMS Field 4:00 p.m.
Wed., Mar. 2 HOUSTON 1:05 p.m. Thur., Mar. 3 Tampa Bay at Port Charlotte 1:05 p.m.
Fri., Mar. 4 BOSTON 7:05 p.m. Sat., Mar. 5 WASHINGTON 1:05 p.m. Sun., Mar. 6 Houston at Kissimmee 1:05 p.m. Mon., Mar. 7 PHILADELPHIA (ss) 1:05 p.m.
Baltimore at Sarasota (ss) 7:05 p.m. Tue., Mar. 8 Atlanta at Lake Buena Vista 1:05 p.m.
Wed., Mar. 9 PITTSBURGH 7:05 p.m. Thur., Mar. 10 Philadelphia at Clearwater 1:05 p.m.
Fri., Mar. 11 ATLANTA (ss) 1:05 p.m.
Toronto at Dunedin (ss) 1:05 p.m. Sat., Mar. 12 Washington at Viera 1:05 p.m. Sun., Mar. 13 MINNESOTA 1:05 p.m. Mon., Mar. 14 Boston at Ft. Myers 7:05 p.m.
Wed., Mar. 16 BALTIMORE 7:05 p.m. Thur., Mar. 17 TAMPA BAY 7:05 p.m.
Fri., Mar. 18 Toronto at Dunedin 1:05 p.m. Sat., Mar. 19 TORONTO 1:05 p.m. Sun., Mar. 20 Philadelphia at Clearwater 1:05 p.m. Mon., Mar. 21 Tampa Bay at Port Charlotte 7:05 p.m. Tue., Mar. 22 Baltimore at Sarasota 1:05 p.m.
Wed., Mar. 23 TORONTO 7:05 p.m.
Fri., Mar. 25 HOUSTON 7:05 p.m. Sat., Mar. 26 PITTSBURGH 1:05 p.m. Sun., Mar. 27 Minnesota at Ft. Myers 1:05 p.m. Mon., Mar. 28 TAMPA BAY 7:05 p.m. Tue., Mar. 29 DETROIT 1:05 p.m. If you’re interested in tickets, please call (813) 879-2244 or visit the Yankees Official Website. Tickets for potential 2010 American League Division Series (ALDS) and American League Championship Series (ALCS) games at Yankee Stadium will go on sale to the public online at yankees.com on Wednesday, September 29 at 10:00 a.m. So, get those computers fired up. I’ll see you there! The Yankees Opening Day/Home opener is on 3/31/2011. They’ll be playing the Detroit Tigers. They close the season in Tampa against the Rays on September 28th. NEW YORK (AP) — The major league baseball schedule for 2011 features a midweek start in March, a late September ending and the Chicago Cubs’ first visit to Fenway Park in nearly 100 years. Five openers are set for Thursday, March 31, although one of them is expected to be moved up to the night of March 30. The regular season is set to end on Sept. 28. By opening and closing a week earlier this year, the 2011 World Series will finish in October, barring any postponements. Game 7 this year is set for Nov. 4. Mo v. the Captain: Joe Posnanski tries to figure out who has been the most important Yankee player since 1996. Joe Pawlikowksi over at RAB talks about Phil Hughes developing curveball. He claims that Hughes has relied on his four-seam and cut-fastball (throwing them a combined 76.4 percent of the time) throughout the season. He’s thrown his curveball more often of late, but the pitch isn’t as effective as it once was. Just a few days ago (Aug. 13th), Orlando Hernandez, pitched againt the Trenton Thunder. He’s attempting a comeback at the age of 44 with the Washington Nationals. I wonder how that will work out. We wish the best of luck to El Duque. Ruth family photos hit auction block: “A collection of autographed Babe Ruth photos originally owned by his sister and never seen by the public have hit the auction block through SchulteAuctions.com. The collection consists of five original photos and an inner book cover, which was signed, dated and personalized by The Bambino to Mamie Margaret Ruth-Moberly. The items have been consigned by the family and have never before been publicly available. Ethics commission calls for Gov. Paterson to pay $96K fine for free Yankees World Series tickets. The ‘Dog Days of Summer’ are coming to a close and not surprisingly, October is on the horizon again for the 2010 New York Yankees. With strong and reliable pitching, the emergence of Robinson Cano, Nick Swisher, and Brett Gardner, and the consistency of Mariano Rivera and Derek Jeter, the Yankees have put themselves in the driver’s seat in both the AL East, and the AL Championship (http://es.pn/bcuDuH). Although they share a 5.5 game lead with the Tampa Bay Rays over the Boston Red Sox (8/19/2010), the Yankees have set themselves up for an all but sure shot at the World Series this October (I’m knocking on wood here, fans). Despite all this great news for the Yankees, here at SeatGeek we have noticed even greater news for Yankees fans. 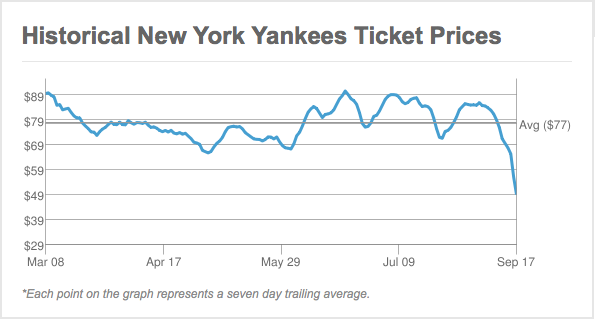 The average ticket price for upcoming Yankee home games continues to fall. The Yankees ticket prices have had the highest average value for most of this season, yet they have recently slipped to #10 of the 30 teams with an average price of $49 per ticket, the lowest it’s been all season. This might be because of the upcoming road trip or the fact that a majority of the Yankees opponents for the rest of the year aren’t contending for a post-season berth. This is great for cash conscious consumers who have yet to see a Yankees game this season. If you haven’t, now there is more of a reason to than before — strike while the iron is hot! Surprise your lady-friend, be a hero to your kids, wow your friends with some great seats. Of the Yankees’ final 21 home games 14 of those are against teams that you can all but write off for a post-season berth. We’ve sorted the remaining home games by average cost of a ticket, and there are some relatively affordable games to see this September. As you can see, the most affordable upcoming Yankee home games coming up are:1. NYY v. BAL on 9/6 with an Avg. price of $54.13 per ticket2. NYY v. OAK on 9/2 with an Avg. price of $55.58 per ticket3. NYY v. BAL on 9/7 with an Avg. price of $59.24 per ticketYou can sort through the remaining Yankees home games and buy tickets here. Tickets for today’s game against the Detroit Tigers can be had for as low as $10.00 a ticketConversely, if you are looking to make some coin in the final month of the season, you better already have a supply of Yankees vs. Red Sox tickets. 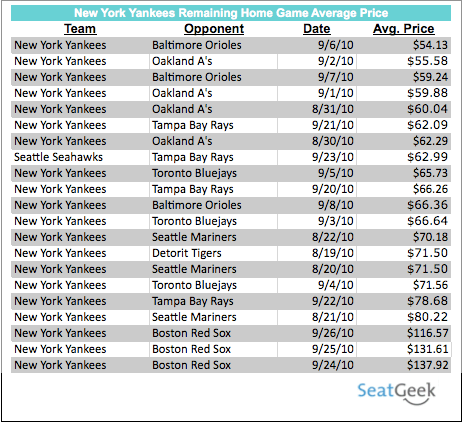 This is the last home stand for the Yankees, and as expected, these tickets have the highest average price. SeatGeek is forecasting that tickets to these games will sell for an average price of $137.92, $131.61, and $116.57 respectively.